For decades now we've been hearing about rising rates of obesity and the health risks associated with excess pounds. But we've also heard that diets often fail, or even make people gain weight and that most diets are either ineffective or downright dangerous. No wonder my patients sometimes ask me: Isn't there any diet you'd recommend? 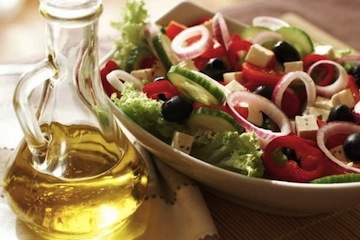 Though it's been known for a while that the Mediterranean diet, which emphasizes fruits and vegetables, legumes, nuts and seeds, whole grains, healthy oils such as olive oil, fish, red wine, and modest amounts of cheese, meat, dairy, can lower risk of heart disease, even among those at high risk, a study just released showed that the benefits of this diet are more numerous and more dramatic than previously realized. Researchers at Harvard Medical School and the Harvard School of Public Health followed over 10,000 middle aged women (average age 59) for 15 years. Over that time, as the women moved from middle age to early older age, those whose diet more closely resembled the Mediterranean style of eating were 40% more likely to live past 70 and less likely to develop Parkinson's disease, cancers, memory problems, and other health issues. In this report from WBUR, Dr. Meir Stampfer, who led the study, emphasized that the healthier women's diets, which were assessed by questionnaire and not strictly supervised or prescribed, did not differ radically from the less healthy women's diets. The healthier women weren't vegans (though that's healthy, too) nor did they deprive themselves of treats. They simply, on average, ate more healthier foods and fewer less healthy foods. These findings are welcome news, especially to middle aged women who are wondering if it's too late change their diets (it isn't), whether it would be really hard to make a healthy change (it isn't) and whether it's worth the effort to do so (it is). Interested? Look here for specific guidelines from Harvard Medical School and take a quiz to see how Mediterranean your diet already is. Remember that for weight loss, even healthy foods (especially high fat items like nuts and oils) will have to be eaten in moderation, and that exercise and stress management are also important for maintaining health. Is your doctor ready to prescribe medical marijuana?